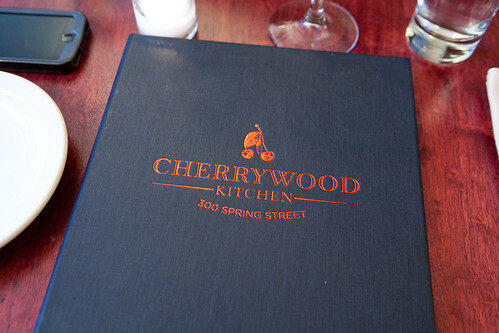 Cherrywood Kitchen is a new restaurant that’s on Hudson Square or the far west part of SoHo on Spring Street. 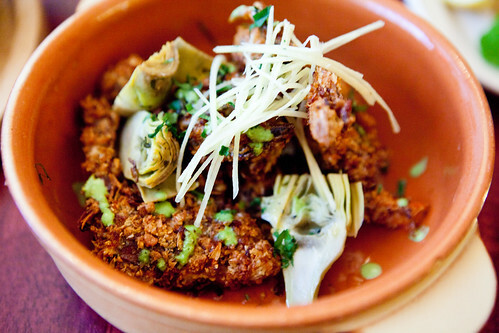 This restaurant has the potential to serve good food in a place that generally a food wasteland. 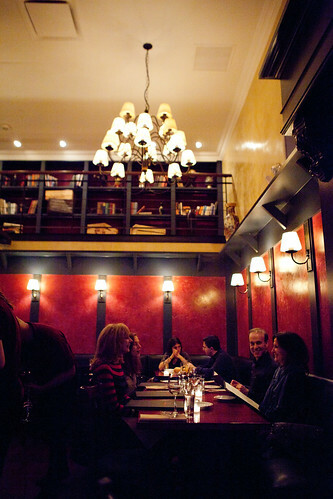 The space is reflective of the restaurant’s name having cherry wood tables and finishes and have a cherry red wall toward the back of the dining space. Airy from the high ceilings. The restaurant is under the helm of Chef Chris Cheung’s who has apprenticed at Nobu and Jean Georges and had stints at Monkey Bar (pre-Graydon Carter). He created an unique menu that does push the average diner to be a little more daring as Chef Cheung created a few unusual food pairings in his dishes, as you’ll see soon. My companion and I started with their Cherrywood Sangria ($12), a not too sweet, fruity cocktail. Light and refreshing for the lovely spring evening we were there. 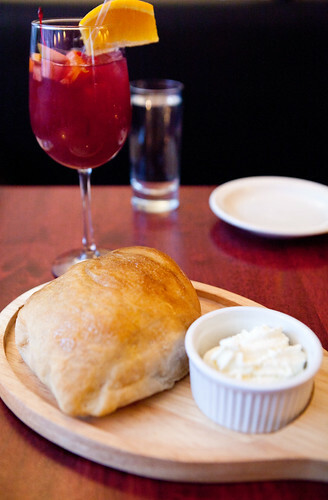 The house made foccacia with whipped blue cheese cream was decent. The pomelo-sized focaccia was appropriately salted but needs to be kneaded and rest a bit more (creates better gluten structure) but the nitrous oxide whipped blue cheese was interesting and worked well with the bread. 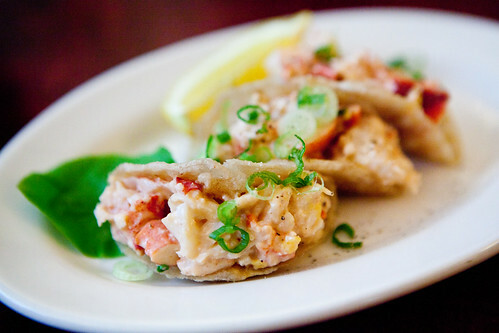 We started with Little Lobster “Tacos”, Old Bay Hollandaise ($14), these dainty trio of “tacos” are filled with fresh, tender Maine lobster chunks that’s perfectly coated in a creamy, mildly spicy Old Bay hollandaise. It’s a good snack. The Seared Duck, Crispy Sweetbreads, Spring Radishes, Cherry Glaze ($28) was a beautiful, artistic mess of perfectly seared duck breast dabbled with a tart cherry glaze, crisp fried sweetbreads, dotted with bitter radishes and small leaves of fresh Romaine lettuce. My impression that we’re supposed to make wraps out of these (like a Korean ssäm) and it does work better that way than in individual parts. Together, these components of the earthy sweetbreads, slightly gamy duck and fresh, bitter radishes worked beautifully together. The Garlic and Shallot Softshell Crabs, Baby Artichokes, Lemon Butter ($27) was simply delicious. As the dessert plate-sized softshell crabs were encrusted with garlic and shallots, making it intensely scented while it landed on our table. The baby artichokes worked well with it. It’s incredibly addictive to eat. 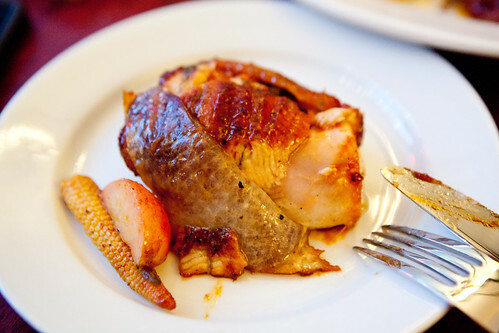 The recent popularity of “fresh killed chicken” (just read The New York Times’ “Diner’s Journal” by Jeff Gordinier, he’ll explain it all), the kitchen crew took this very fresh chicken (from a farm in Pennsylvania), stuffed it with eel, smoked this concoction, bathe it in Southern Comfort liqueur and glazed it in barbecue sauce and finally roast it. 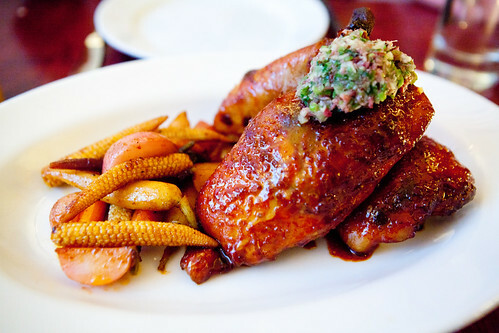 This creates an incredibly sweet, smoky with subtle hints of fruit and both meats were succulent and fork tender. In some vague way, the flavors reminds me of the Chinese (Cantonese) flavors I grew up with (the sweet-savory barbecue sauce and the ginger scallion sauce that topped this chicken). This dish haunted me all weekend. It’s really that good. The desserts unfortunately were the weakest of the entire meal. The Shanghai walnut crusted cheesecake ($10) sounded unusual because we were wondering what makes their cheesecake, Shanghai? Nothing as it turned out. 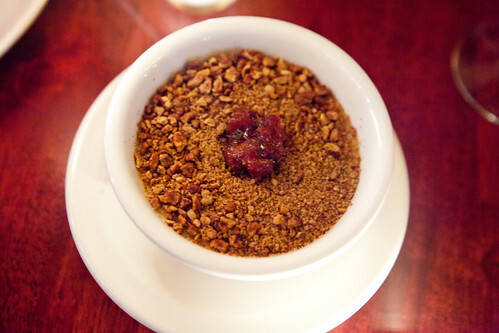 It’s just an upside-down cheesecake lined with blood orange compote and coated with a layer of finely chopped, toasted walnuts. It’s tasted kind of flat. It needs a sharper or more robust flavored fruit to make this dessert more appealing to eat. 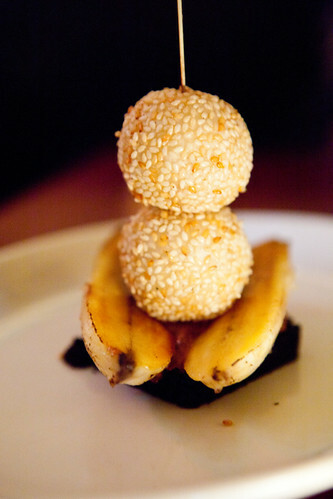 The Valrhona chocolate, caramelized banana, sesame fritters ($11) does not make sense together as a dish and better as individual parts. The sesame fritters were miniature red bean jien duy (fried sesame balls that are popular dim sum snacks) that were perfectly fried. The caramelized bananas were fine but the chocolate cake wasn’t executed so great as it was very dense like a fallen soufflé. 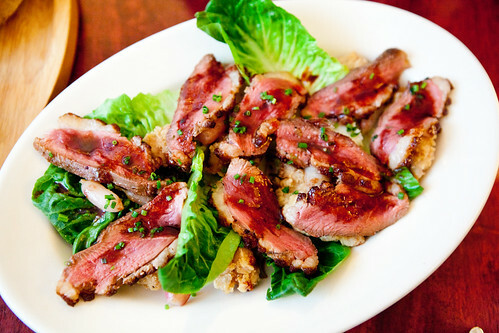 Overall, service is great and most of their savory dishes that reads as experiments are generally good. The wine and cocktail prices are reasonable and has good options. This is a restaurant that has potential to be the neighborhood spot that this part of west SoHo is hoping for.